Earlier this summer, I came across a beautiful aerial video of the Paradise Creek Nature Park in Portsmouth, Virginia. I’d been following the folks at The Elizabeth River Project for awhile, and was so impressed by their Paradise Creek restoration efforts and wanted to learn more about their projects. I contacted The Elizabeth River Project, and the Recreation and Education Programs Manager at the Paradise Creek Nature Park, Sarah Sumoski, was eager to provide US 17 with information. My thanks to Sarah for sharing a bit of this beautiful park with the rest of us! The Paradise Creek Nature Park is just a short detour off of Highway 17 (the George Washington Highway) – at 1141 Victory Boulevard, Portsmouth, Virginia. The photographs are by Samuel Shaver and are posted here with his permission. 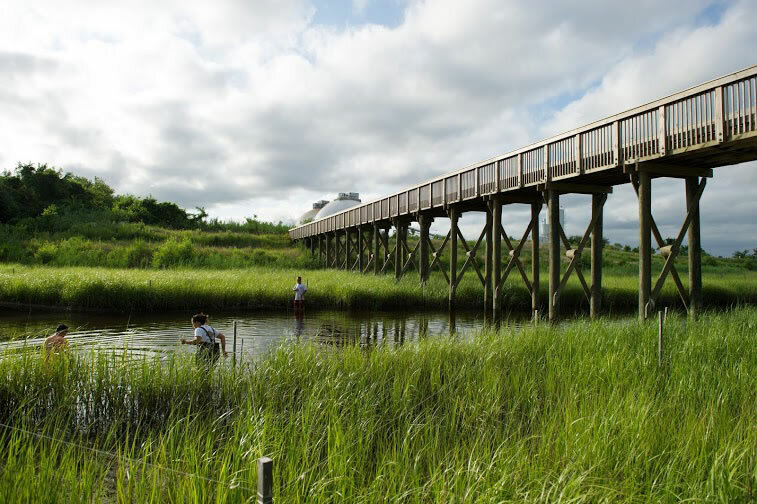 US 17: First, thank you for agreeing to do this Q&A with US 17 – I’ve been following the Elizabeth River Project for awhile now, and have been so impressed by the Paradise Creek Nature Park that I wanted to learn more about the project. So let’s start with the Elizabeth River – what’s significant about this waterway? Sarah Sumoski: The Elizabeth River has played an integral role in our nation’s history. She provided food for Native Americans and early explorers such as Captain John Smith, hosts the oldest and largest naval shipyard in the country, Norfolk Naval Shipyard, and is classified as the largest natural harbor in the world. Today, an estimated 500,000 residents live along the Elizabeth River and her waterway acts as a gateway for shipping imports and exports around the world. Stretching into 4-major cities, Portsmouth, Chesapeake, Norfolk, and Virginia Beach, the Elizabeth River has her share of problems too. Pollution, industry, and hardened shorelines threaten the health of this Keystone River. US 17: So what is the Elizabeth River Project, and what is their mission? Sarah Sumoski: The Elizabeth River Project is a non-profit organization founded in 1991 by four local citizens worried about the health of their home river. Today, The Elizabeth River Project strives to restore the Elizabeth River to the highest practical level of environmental quality through government, business and community partnerships. US 17: I read that Paradise Creek Nature Park opened to the public in June of 2013 – could you share with us a bit of the history of this park – how this park was created and what organizations were involved in its development? Sarah Sumoski: The vision for Paradise Creek Nature Park began in the early 2000’s during efforts to clean up Paradise Creek – once listed on the nations “worst of the worst” list among polluted sites. 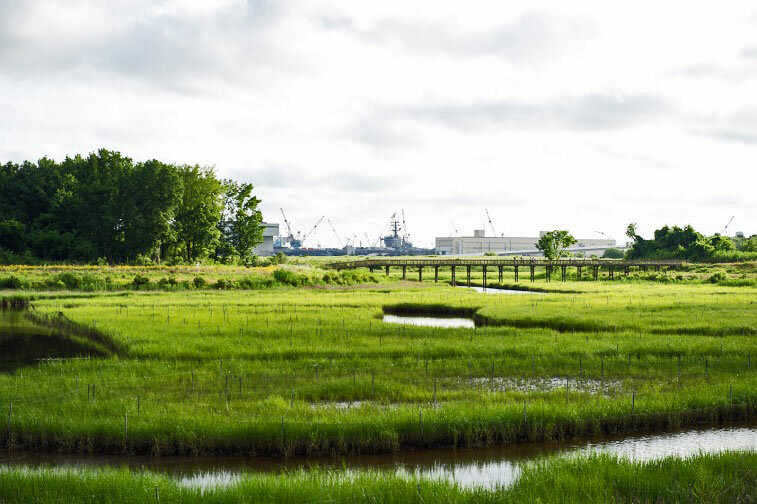 A tributary to the southern branch of the Elizabeth River, Paradise Creek is home to industries and neighborhoods, including historic Cradock, created to provide housing for our nation’s oldest shipyard, Norfolk Naval Shipyard. In 2006 planning for the future 3rd largest park in Portsmouth began with The Elizabeth River Project, the City of Portsmouth, and the Virginia Port Authority all in agreement. In 2008 The Elizabeth River Project finalized its purchase of the 40-acre plot, which included forest and open fields, known colloquially as the mudflats. The next step was to bring back the wetland of Paradise Creek which in the 1950’s was filled in with dredge spoils from the river. 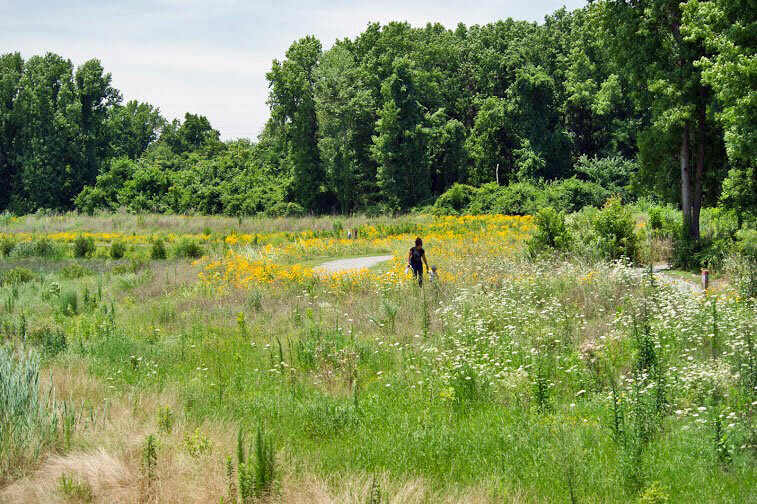 The Virginia Port Authority removed 300,000 cubic yards of this fill in 2012 creating a winding creek and wetland oasis for park visitors and wildlife. Paradise Creek Nature Park officially opened to the public in June 2013, but we’re not done yet! Upcoming construction will bring a signature entry pavilion and composting toilets, an open air wetland learning lab classroom, picnic pavilion, kayak ramp, and natural children’s playground for park visitors to enjoy. US 17: If someone were to visit the park, what would they be able to see and do? 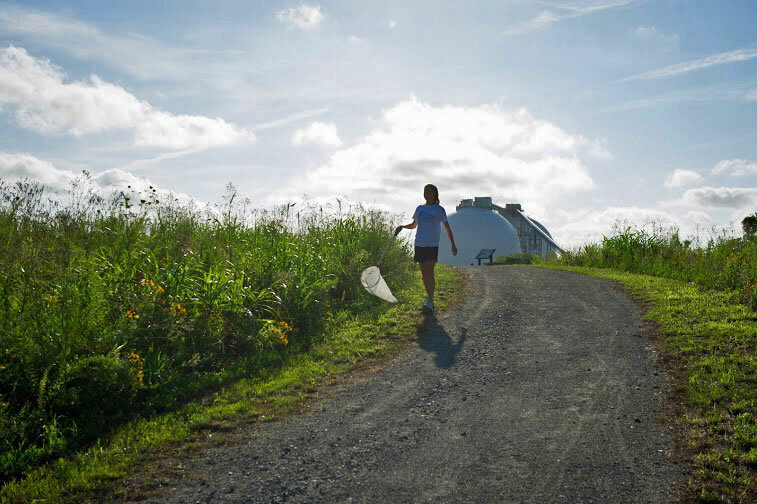 Sarah Sumoski: Visitors to Paradise Creek Nature Park are free to walk, run, or bike over two miles of trails which weave along wildflower meadows, through 29-acres of revitalized forest, and around an 11-acre restored wetland. The park is open from dawn to dusk, and leashed pets are welcome, making it an ideal location for pet owners. Public and private programs turn the park into an outdoor classroom offering a closer look at the wildlife found at the park and a view of the Elizabeth River coming back to life. US 17: What other Elizabeth River projects are on-going or planned for the near future that you’d like to share with us? Sarah Sumoski: We are in the process of phasing out our targets on the Lafayette River and moving efforts to the Eastern Branch of the Elizabeth River. Largely, involving homeowners, businesses, and schools through our RiverStar program to help reduce impacts on the river and clean her shores! US 17: Are there any activities planned for Paradise Creek Nature Park or the Elizabeth River Project in which the public can participate? If someone was interested, how might they get involved and who should they contact? Sarah Sumoski: Absolutely! Free public programs at the park occur nearly every Friday and Saturday and offer fun for all ages. Our programs include Volunteer Events for families, groups, or individuals, Mini-Safari’s for self guided exploration of the park, Healthy River Healthy You programs to get you active and moving in the fresh air, and special programs which vary month to month. You can find a complete listing at the park website: www.ParadiseCreekNaturePark.org or contact me at ssumoski@elizabethriver.org for information. Sarah Sumoski: I’ve traveled nearly the entire stretch in Virginia. I have to say the area just south of Fredericksburg and North of Gloucester is a preferable alternative to I-95. The rolling countryside and forest makes for a relaxing and stress free drive.